This is the first spring for my four-year-old daughter Fira at her new preschool in Santa Monica, California. When I began making arrangements for Novruz (First Day of Spring, March 21st), Fira was so eager to share our Azerbaijani holiday traditions with her friends at school. They come from many countries including India, China and Japan. Fira is the first Azerbaijani ever to attend her school. One week before Novruz, I brought a plate of "samani" to school. Fira and I had planted the wheat berries together a few days earlier. Very soon the seeds grew into the emerald patch of grass, symbolizing the coming of the new planting season - Spring Equinox. Above: Lala Baloghlanova, author of article, with her two daughters, Fira 4, and Farrah, 3, who helped her prepare the Novruz treats to share at school. It seems the children, too, were conscious of nature although the sprouts had barely started to appear. When Fira's teacher first saw what we had planted, she called it "grass cake". Fira giggled and insisted: "This is 'samani'!" My daughter was so happy. Now her friends could see some of the traditions from her country. Every day, the children carefully watched and watered the "samani". It wasn't long before the wheat grass had sprouted five to six inches right in front of their eyes. It looked like a patch of grass growing on a plate. Above: The wheat grass or "samani" as it is called in Azeri. Traditionally, each family grows "samani" at Novruz, to celebrate the first day of Spring, March 21st. On the day before Novruz, Fira and I began dyeing eggs. This is a tradition much like dyeing Easter eggs. Fira loved dipping the eggs into the bowls of food coloring. The next day we arranged a tray (called "khoncha" in Azeri) of traditional sweets and headed off to school. The tray was filled with cookies, candles, colored eggs and nuts. It was a gorgeous day - full of light and sunshine. When we arrived at school, a crowd of noisy and curious kids gathered round us. Fira marched right through the group, holding her head up proudly, as if saying: "This is what I was telling you about Azerbaijan!" We placed the tray on the table, and children were eager to hear about this holiday of "grass" and cookies in Fira's country. I mentioned about other traditions associated with Novruz, too. Not just "samani". The boys wanted to hear more about jumping over bonfires. This practice symbolizes leaving behind the badness of the previous year and the hope of building good relationships in the new year. It's called "Charshanba Akhshami" and is observed on the four Tuesdays, before March 20 and 21st. These Tuesdays, in turn, are distinguished from each other - "Water Tuesday" (Su Charshanba), "Fire Tuesday" (Od Charshanba), "Earth Tuesday" (Torpag Chershanba) and "Last Tuesday" (Akhir Charshanba) which is considered the most important one. 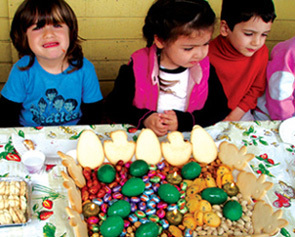 Above: Azerbaijanis dye eggs, much like "Easter eggs" and extend trays of sweets to guests during Novruz Holidays. On the last Tuesday, children place their hats in front of neighbors' doors and then rush to hide so that their identity will be kept a secret. Neighbors fill the hats with sweets and then the children come back to retrieve them. It's quite like Halloween. 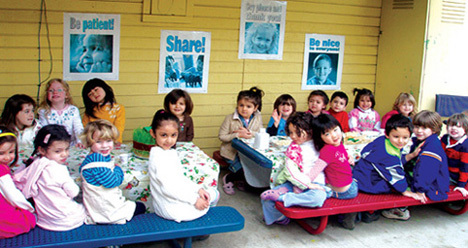 California, where Fira Baloghlanova, 4, shared Novruz traditions with her fellow classmates. Fira explained what to do with the eggs - tapping them against each other. It's a favorite with kids. Each person chooses a colored egg, trying to determine which one has the hardest shell and then they tap their egg against someone else's, trying to crack it. The person whose egg doesn't crack for the longest amount of time is declared the winner. I overheard Fira and her friends talking about these traditions. Inquisitive Will was concerned: "But isn't it dangerous to jump over a fire?" Fira: "We make little bonfires for little children." Michael: "Can everybody jump over the fires?! Even kids!" Then Egle, the teacher, asked Fira: "What's the best thing about your country?" Fira thought a bit and then answered: "When you go outside, there are lots of people there, and everybody talks and plays together." (I'm sure she was referring to the gatherings with our large extended family when all the cousins, aunts and uncles, grandmas and grandpas come together). This sounded exciting to Charlotte: "Can I come to Azerbaijan with you one day?" Happy Fira: "When we're done here, we'll go back home and I'll take you with me. (Fira understands that one day her daddy's assignment at the consulate in Los Angeles will be over, and we'll move back to Baku). Daniel, who is always so quiet, piped up: "I would like to go to Azerbaijan to jump over a bonfire." And then, he added - ever to meekly - "a little fire, just a little one."